Our Great Yarmouth office has a long and varied history – before it became our office it was actually a pub known as ‘The Wrestler’s Inn’. The building still retains much of its cultural heritage today! When he landed at Great Yarmouth after the Battle of the Nile in 1798, he was given a hero’s welcome and carried to the Wrestler’s Inn on Church Plain. There he was presented with the Freedom of the Borough, and legend has it that when the town clerk was administering the oath he noticed that Nelson’s left hand was placed on the Bible and exclaimed, “Your right hand, my Lord!”, “That,” replied Nelson curtly, “is at Tenerife”. Another story goes that the landlady of the Wrestler’s Inn asked Nelson if she could rename the pub, ‘The Nelson Arms’ in his honour. Nelson replied, “That would be ridiculous, seeing as I have but one”. In 1817, James Sharman was appointed “Keeper of the Pillar”, and looked after the Monument for 50 years until his death in 1867 at the age of 82. As a 14-year old, Sharman was working as a waiter at the Wrestler’s Inn when he was forcibly press-ganged into the navy. He went on to serve on HMS Victory at Trafalgar. He later claimed to have helped carry the fatally wounded Nelson below decks, though this may have been his own embellishment in order to gain extra tips from visitors! Sharman was certainly a colourful character. His better documented exploits included a brave rescue of several sailors from the brig Hammond which was shipwrecked on the beach near his house in 1827. Charles Dickens read a newspaper report of this. While writing David Copperfield, which is partly set in Yarmouth, he visited Sharman, and apparently based the character Ham Peggoty on Sharman. An event that Sharman must have witnessed occurred in 1863, when an acrobat called Charles Marsh climbed up to stand on Britannia’s shoulders. Sadly, he missed his footing while climbing down and plunged to his death before the horrified crowd gathered below. The Wrestler’s Inn remained a pub right up until 2013. 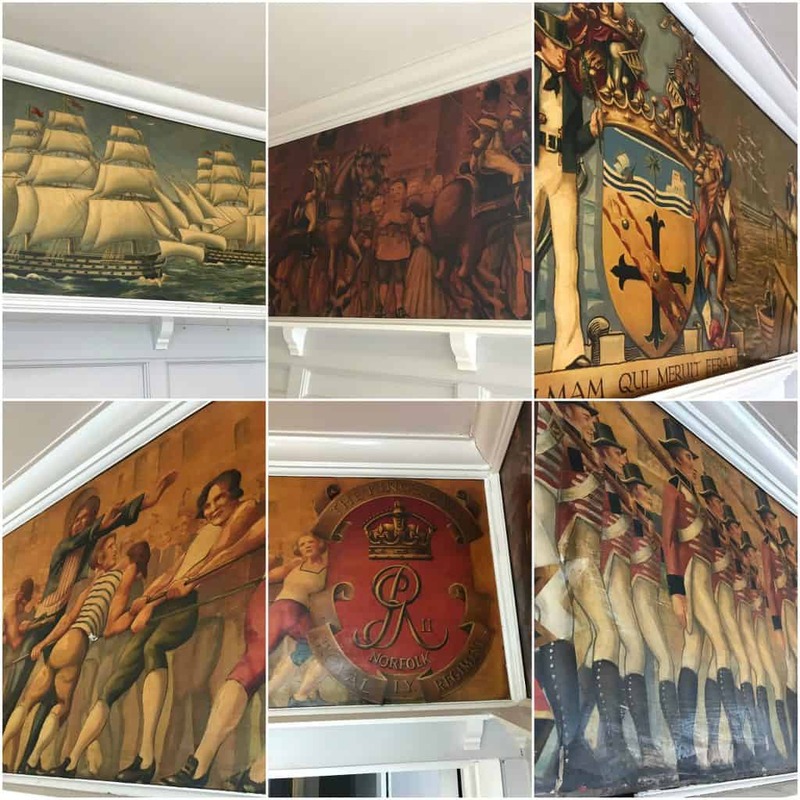 We acquired the property in 2014, and to this day people still take an interest in the building and its history, the occasional person will pop-in and ask to have a look around this historical building, often with the intention of getting a look at the famous Nelson mural photographed below. Outside our office, there are two plaques (photographed below), one concerning Nelson and the other Sharman. The next time you’re in the area, be sure to keep an eye out for these or better yet, come on inside! Wonderful, I would like to see it sometime. What date are the paintings? A very good question! Unfortunately, we aren’t sure of the exact date the mural was painted. However, we do know the date of a similar painting in the building, which we could assume is from roughly the same time period. In which case, we could make an educated guess that the mural was painted in the early 1800s. It’s perhaps not the concrete answer you were looking for, but it’s the best guess us humble accountants can make!